There has been some confusion about Navalny’s poll ratings due to the varying timing, phrasing, and options in the polls on the matter. The Russian Spectrum tries to clear things up. 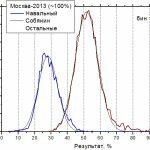 Below is a summary of comparable polls on this subject by date from two of Russia’s three biggest polling agencies: The private Levada Center, and state-owned pollster VCIOM. The Levada polls asked, “Which of the following candidates are you prepared to vote for in the Moscow mayoral elections of 8th September?” It divided the respondents into three groups: “All Muscovites,” “… of which prepared to vote,” and “… of which have made their decision.” Though figures were given for all three, I am listing only the first group (“all Muscovites”) to make the Levada figures comparable to all the other polls, which had no such division. The VCIOM polls asked their respondents who they were going to vote for if the elections were held this Sunday. All polls were adjusted to exclude those who don’t have an opinion, didn’t intend to vote, or planned to spoil their ballot, just as would happen in a real election. The jobs agency SuperJob and the company Synovate Comcon also carried out polls. Should Navalny start celebrating that bump at the end? Probably not. The SuperJob poll only asked the “economically active” parts of the population. It is not exactly a secret that many of Navalny’s supporters are younger people, so their 26% likely overstates his actual level of support. Furthermore, pensioners tend to have higher turnout rates in Russian elections, a factor which is likely to favor Sobyanin. There is definitely an upwards trend coinciding with the recent furor over Navalny’s conviction, and his release on bail the day after. But catching up with Sobyanin, who remains dominant, is a tall order. PS. I did not bother include polling numbers for the other candidates. Suffice to say all the polls have them all down in the single digits. 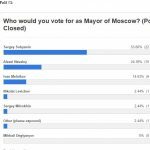 Amusingly, the Fair Russia candidate Nikolay Levichev got an absolute 0.0% in the last two Synovate polls.